Early Wynn Jr. (January 6, 1920 – April 4, 1999), nicknamed "Gus", was an American professional baseball right-handed pitcher. He played in Major League Baseball (MLB) for the Washington Senators, Cleveland Indians, and Chicago White Sox, during his 23-year MLB career. Wynn was identified as one of the most intimidating pitchers in the game, having combined his powerful fastball with a hard attitude toward batters. He was inducted into the Baseball Hall of Fame in 1972. Wynn signed with the Senators at the age of 17, deciding to forego completing his high school education, in pursuit of a baseball career. He spent a couple of seasons in Minor League Baseball (MiLB), achieving a brief MLB stint in 1939. Wynn returned to the big leagues in 1941, pitching his first full MLB season in 1942. Wynn missed all of 1945 and a portion of the 1946 season, while serving in the United States Army during the latter part of World War II. Wynn was a member of one of baseball's best pitching rotations, along with Bob Feller, Mike Garcia, and Bob Lemon, while with the Indians in the mid-1950s. He won the 1959 Cy Young Award, beginning to rely more heavily on the knuckleball, as the velocity of his pitches declined. Wynn retired following the 1963 season. He finished with exactly 300 career wins, having spent the last several months of his career in pursuit of that win. Wynn served as a coach and broadcaster in the big leagues, after his retirement as a player. In 1999, he was included on The Sporting News list of the 100 greatest players in baseball history. Wynn died that year in an assisted living facility following heart-related problems and a stroke. Wynn was born in Hartford, Alabama, the son of Blanche Wynn and Early Wynn Sr., an automobile mechanic and former semipro baseball player. He excelled at both football and baseball in high school. As a sophomore, Wynn was about to become the top running back at his school when he suffered a broken leg on a punt return. The injury forced him out of football and focused his attention on baseball. Wynn later described it as "my best break ever." When he was a teenager, Wynn attended a tryout session in Florida for the Washington Senators. He impressed Senators coach Clyde Milan enough that the organization offered him a minor league contract. Wynn signed with Washington for $100 per month and decided not to finish high school. Between 1937 and 1939, Wynn pitched minor league baseball in the Florida State League and the Piedmont League. Wynn made his MLB debut in 1939, appearing in only three games before returning to the minor leagues for 1940. He made it back to the major leagues in 1941, starting five games, completing four of them and finishing with a 3-1 win-loss record. Wynn was named to Washington's four-man pitching rotation in 1942. He pitched 30 games that season, finishing with a 10-16 record and a 5.12 earned run average (ERA). The next season, in 37 games, he finished 18-12 with a 2.91 ERA. He led the league in losses in 1944, compiling an 8-17 record. In a December 1948 trade, Wynn and Mickey Vernon were sent to the Cleveland Indians in exchange for Joe Haynes, Ed Klieman and Eddie Robinson. A month earlier, the Boston Red Sox had offered Johnny Pesky to Washington for Wynn, but the trade did not go through. The Indians' pitching coach and former star pitcher Mel Harder taught him how to throw a curveball, slider, changeup and knuckleball. Wynn assimilated Harder's lessons easily, and after his 1949 season adjustment, the next year he recorded 18 wins and led the AL with a 3.20 ERA. 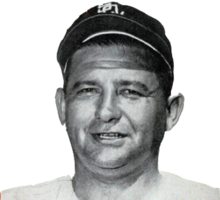 Between 1950 and 1956, Wynn won at least 17 games per season. His first 20-win season came in 1951. By that time he had become part of one of the greatest pitching rotations in MLB history, joining Bob Feller, Bob Lemon and Mike Garcia. Manager Al López later called those four pitchers "the greatest pitching staff I ever saw during 33 years in the majors." In 1954, Wynn posted a 2.73 ERA, won 23 games and struck out 155 batters. The team went to the 1954 World Series; Wynn pitched one game and the Indians were defeated by the New York Giants in four straight games. After suffering from pneumonia at the beginning of the 1955 season, Wynn earned his first win in May. He was an All-Star for the second time in his career and pitched 3 scoreless innings in the game; this selection marked the start of six consecutive All-Star seasons. He finished the 1955 season with a 17-11 record and a 2.82 ERA. In a 1956 game, he was struck in the face by a sharp line drive off the bat of Washington Senators shortstop Jose Valdivielso. He did not leave the game immediately, later realizing he had lost seven teeth. The facial wound required 16 stitches. In 1957, Wynn became the second pitcher in major league history to win a game by a score of 1-0 while recording at least ten strikeouts and hitting a home run. Wynn was traded to the Chicago White Sox after the 1957 season. Wynn and Al Smith were exchanged for Minnie Miñoso and Fred Hatfield. In 1958 Wynn became the first MLB pitcher to lead his league in strikeouts in consecutive years with different teams (184 with Cleveland, 189 with Chicago). He won the Cy Young Award in 1959 at the age of 39, posting a record of 22–10, with 179 strikeouts and a 3.16 ERA which helped lead the White Sox to the AL pennant championship. He was the third oldest MLB pitcher to win 20 games in a season, following Cy Young and Grover Cleveland Alexander. He also was the starting pitcher in the first of two All-Star Games held in 1959 (MLB held two All-Star Games from 1959 through 1962). In the 1950s Wynn had more strikeouts (1,544) than any other pitcher in the majors and was quite capable with the bat as well. A switch hitter, Wynn batted .214 (365 for 1704), with 17 home runs and 173 RBI. His 90 pinch-hit appearances included a grand slam, making him one of five MLB pitchers to record a grand slam as a pinch-hitter. Wynn returned to Cleveland in 1963 for a last run. In that season, he won his 300th game, after failing to collect the milestone win in seven starts over nine months in 1962–63. Both the timeframe and the number of attempts are the longest between any pitcher's 299th and 300th wins in MLB history. Opposing Kansas City batter Ed Charles recalled Wynn's 300th win: "His fastball, if it reached 80, that was stretching it. He was laboring, throwing nothing but bloopers and junk." His last game appearance was on September 13, 1963, pitching the last third inning of the 6th against the Los Angeles Angels in relief of Jack Kralick. He allowed one hit and zero earned runs. Long after his retirement, which came at the end of the 1963 season, Wynn reflected on his 300th win and said that he was not proud of the milestone. "If I had pitched a good game and gone nine innings, that would be something. But that's not the way it was", Wynn said. He left the game with a 5-4 lead after pitching five innings. "Jerry Walker relieved me and saved the game for me. He was my roommate and pitched like a man possessed", Wynn recalled. Wynn said that he had been awake all night before the game, suffering from pain related to the gout that had long affected him. Wynn was the last active major leaguer who played in the 1930s, becoming one of only 29 players in baseball history to have appeared in major league games in four decades. His durability helped him lead the American League in innings three times (1951, 1954, 1959) and propelled him to an AL record for most years pitched (23). Wynn won an even 300 games. He registered five 20-win seasons, 2,334 strikeouts, 290 complete games, 49 shutouts, and 4,556 innings pitched in 691 games. Wynn became the pitching coach for the Indians in 1964. Several of his players – including Sam McDowell, Sonny Siebert, Luis Tiant and Steve Hargan – were still with the team in 1967 when they set a record for team strikeouts in a season. In August 1965, Wynn flirted with the idea of making a comeback as a knuckleball pitcher. Wynn left Cleveland after the 1966 season and joined the Minnesota Twins as pitching coach. He later served as a minor league manager for the Twins. He advocated for better pensions for retired baseball players. In 1972, the team considered activating the 52-year-old Wynn to pitch one inning if retired star Ted Williams would hit against him. The move would have made Wynn the first player to pitch in five different decades, but Williams was not interested and the team dropped the idea. Wynn had first proposed the idea of a one-game comeback to the Twins in 1970. From their inaugural 1977 season through the end of the 1981 season, he provided the color commentary for radio broadcasts of Toronto Blue Jays games, working alongside Tom Cheek. He also provided color commentary for Chicago White Sox radio broadcasts in 1982 and 1983, paired with Joe McConnell. When he was replaced by Lorn Brown in December 1983, White Sox president Eddie Einhorn described Wynn as "a link to baseball's past." In the mid to late 1960s, the pitcher owned the Early Wynn Steak House and Bowling Lanes in Venice, Florida. Wynn was elected to the Baseball Hall of Fame in 1972 along with Sandy Koufax and Yogi Berra. He was grateful, although he expressed disappointment that he had not received the required votes on his first three ballots. In the last years of his life, Wynn suffered a heart attack and a stroke. He moved to an assisted living facility in Venice, Florida, where he died in April 1999. His wife of 50 years had died five years earlier. In 1999, Wynn ranked Number 100 on The Sporting News' list of the 100 Greatest Baseball Players, According to the Baseball-Reference.com, Wynn is the "most linkable" player in baseball history. This means that if a value of 1 is assigned to any player Wynn played on the same team with, and a value of 2 assigned to any player who played on the same team with a player with a value of 1, and so on, and the mean value is found by considering each player in baseball history, Wynn's value is lower than any other player's. His attitude was encouraged early in his career by manager Bucky Harris, who ordered Wynn to throw brushback pitches when he got two strikes on a batter. Otherwise he faced a $25 fine. "I was making $350 a month. I couldn't afford giving up $25", Wynn said. In 1962, when Wynn was with the White Sox, he was throwing batting practice and his teammate Joe Cunningham hit a line drive that missed Wynn by inches. Wynn responded by throwing three straight pitches under his teammate's chin. Whenever one of his teammates was knocked down by an opposing pitcher, Wynn would retaliate by knocking down two of the opposing pitcher's teammates. According to Rod Carew, Wynn's competitiveness did not end when his playing career did. "Early would knock you down in batting practice. If you hit a ball good off of him, he'd knock you down and then challenge you. He told you to expect it when you stepped in the cage against him. ^ Lew Freedman (2009). Early Wynn, the Go-Go White Sox and the 1959 World Series. McFarland. p. 29. ISBN 0786455128. ^ a b Graham, Dillon (April 3, 1942). "Rookie sensation arrives at right time for Senators". Reading Eagle. Retrieved April 2, 2015. ^ a b c Goldstein, Richard (April 6, 1999). "Early Wynn, Pitcher Who Won 300 Games, Dies at 79". The New York Times. Retrieved April 6, 2014. ^ a b c d e f g h i "Early Wynn Statistics and History". Baseball-Reference.com. Retrieved April 6, 2014. ^ "Wynn on way home". Reading Eagle. June 13, 1946. Retrieved April 2, 2015. ^ "Early Wynn hopes to join Senators". Pittsburgh Press. June 13, 1946. Retrieved April 6, 2014. ^ Armour, Mark (2010). Joe Cronin: A Life in Baseball. University of Nebraska Press. p. 191. ISBN 0803229968. ^ Malcolm, Andrew (December 4, 1985). "Benefit for 'Big Bear' of 50's brings bittersweet reunion". The New York Times. Retrieved April 6, 2014. ^ "1954 World Series". Baseball-Reference.com. Retrieved April 6, 2014. ^ "Wynn hurls first 1955 win as Indians beat Bosox". Daytona Beach Morning Journal. May 3, 1955. Retrieved April 2, 2015. ^ a b Purdy, Dennis (2006). The Team-By-Team Encyclopedia of Major League Baseball. Workman Publishing Company. p. 360. ISBN 0761153764. ^ Bierman, Fred (May 2, 2009). "One-Man Show". The New York Times. ^ "Knuckle ball putting Early Wynn back in top ranking". Prescott Evening Courier. June 18, 1959. Retrieved April 6, 2014. ^ Vecsey, George (August 5, 2007). "Sports of the Times; Chasing No. 300, Yesterday, Today, Tomorrow". The New York Times. Retrieved September 20, 2013. ^ a b Mooshil, Joe (May 6, 1982). "Early Wynn Not Proud of 300th Win". Times-Union. Retrieved September 20, 2013. ^ "Early Wynn May Try Comeback". Reading Eagle. August 9, 1965. Retrieved September 21, 2013. ^ "Twins Name Early Wynn Mound Coach". Sarasota Herald-Tribune. October 16, 1966. Retrieved September 21, 2013. ^ "Hall of Fame pitcher Early Wynn dies at 79". Los Angeles Times. April 6, 1999. Retrieved April 6, 2014. ^ "Early Wynn Won't Pitch". Lawrence Journal-World. September 18, 1972. Retrieved September 21, 2013. ^ "Will Early Wynn Take Hill Again?". Lawrence Journal-World. August 15, 1970. Retrieved September 21, 2013. ^ "Chisox replace Early Wynn". Ottawa Citizen. December 5, 1983. Retrieved September 21, 2013. ^ Breslin, James (April 5, 1963). "The old Indian's last stand". Life. Retrieved April 6, 2014. ^ Rathet, Mike (January 20, 1972). "Sandy Koufax, Yogi Berra, Early Wynn Picked for Baseball Hall of Fame". Youngstown Vindicator. Retrieved September 20, 2013. ^ "Hall of Famer dies at age 79". The Victoria Advocate. April 6, 1999. Retrieved September 21, 2013. ^ "Pitcher Early Wynn Dead at 79". The Nevada Daily Mail. April 7, 1999. Retrieved September 21, 2013. ^ "100 Greatest Baseball Players by The Sporting News : A Legendary List by Baseball Almanac". Baseball-almanac.com. Retrieved 2013-03-27. ^ Roger Kahn, Golden Triumphs, Tarnished Dreams, Sports Illustrated (August 30, 1976). Retrieved on April 17, 2012. ^ Nash and Zullo, supra, at page 123. In Roger Kahn's version of the incident, the knockdown pitch occurred after Joe hit one long drive, and Wynn then said to his son, "You shouldn't crowd me." See Roger Kahn, Golden Triumphs, Tarnished Dreams, Sports Illustrated (August 30, 1976). Retrieved on April 17, 2012.